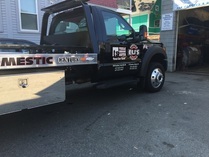 Need a Tow Truck in Arlington, MA? Most Towing companies offer full service towing for breakdowns, lockouts, flat tire repair. Towing & Wrecker service for tractor trailers, RV's, campers and motorcycles. Eli's Service Station has a dedicated tow truck for Arlington towing services.